Korean Traditional Snacks or Han-gwa are always present on special occasions like Chuseok (Thanksgiving Day) and Seollal (Chinese New Year) specially when there's Jesa or when the family holds a ceremony for the repose of one's ancestors. Korean traditional snacks are included in the sacrifices offer for the death. This box of hangwa is a gift from hubby's friend and because we don't practice jesa at home, we brought to my in-laws who always do jesa at home. The long ones on the corner of the box are like pop rice. They are soft and sweet. In the middle of the right side are grains. They are a little bit hard and crispy. The brown ones on the middle left side of the box are too sweet and glutinous. They are just snacks but the price is surprising. They are one of my favorite snacks. Whenever we travel around Asia, mango is always my hubby's choice in the market. He loves mangoes that he can eat a kilo of riped mangoes in one seat. He can't stop eating once he started to eat. So, when a friend went home, my brother asked what I wanted so he could send through a friend. Actually, I don't miss any food from home except unripe mangoes and sauce (fermented shrimp). 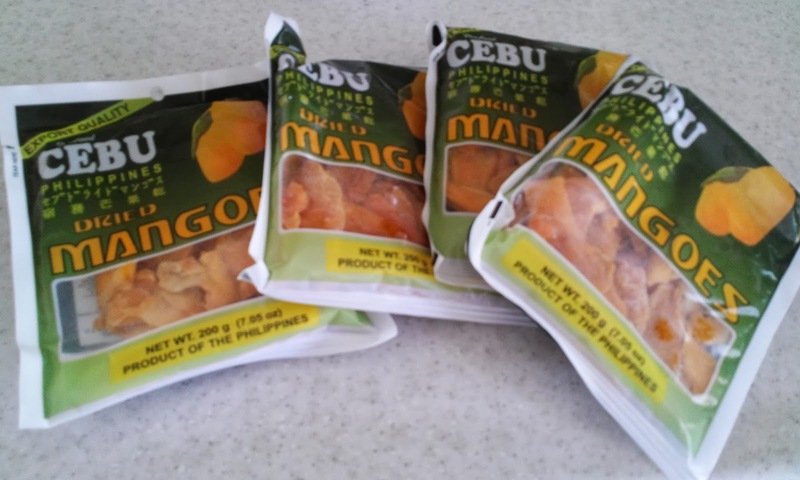 But it's impossible to bring mangoes here in Korea so I asked him to send dried mangoes for my hubby, instead. My hubby loves riped mangoes either dried or fresh. But I don't. So I told my hubby if he likes to eat dried mangoes and he was so happy to hear about it. So when a friend came back, here's what my brother sent me. Dried mangoes for my hubby. Apples from a friend, tangerines and persimmons from my mother in law. Koreans always have desserts after meals so having lots of fruits at home is just normal. I think it's one of the reasons why Koreans have flawless skin because they eat lots of fruits. Fruits are very expensive here specially when there's an occasion like Thanksgiving day and Seollal or Chinese New Year because they are famous for gift-givings. Boxes of fruits are sent to the relatives or friends during these occasions. You can't even buy retails of fruits. You need to buy bunches or boxes of them. Although we always have fruits at home, I don't buy them. 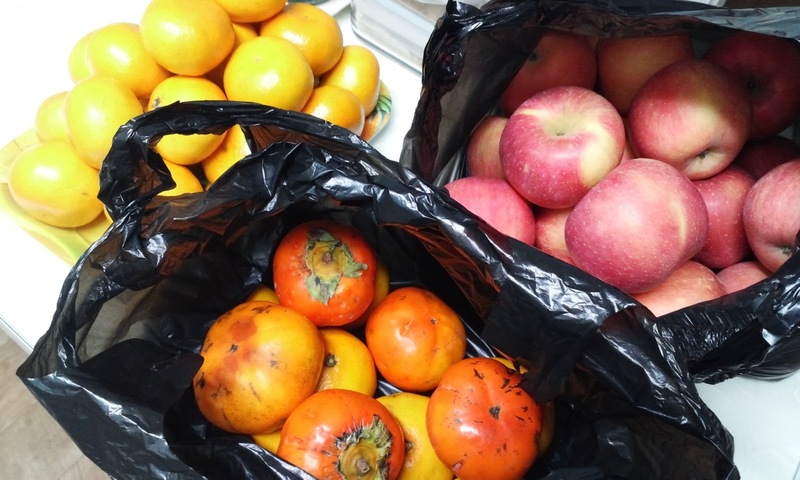 My mother in law always give or send us fruits that sometimes they get rotten and have to throw them away. I don't like fruits much specially apples. My stomach gets upset when I eat apples so sometimes I make fruit shake instead. But I'm usually lazy so I don't make often. But my hubby loves fruits. Seaweeds soup or miyok gook is one of the most famous soup in Korea. It is popular on birthdays and after giving birth. After delivery, the mother eats lots of seaweeds soup because it contains lots of calcium and iodine, the nutrients that is very important for nursing mothers. It is also a tradition to eat miyok guk on birthdays to remind the first food of the mother and passed on to her newborn through her milk which also believes that it brings good fortune for the rest of the year. Miyok guk or seaweeds soup is not only eaten after delivery or during birthdays but also anytime of the year. It is serve as soup at home or in the restaurants because it is known as a highly nutritious soup. It is very easy to cook. Just soak the seaweeds. While waiting for it to become soft, boil some amount of water with minced garlics. It depends how much garlic you put. I like mine with lots of garlic. When the miyok is soft, cut it and put in the boiling water. Boil it for about 10 minutes and put some sesame oil and salt. It's as simple as that but it's more delicious if you put some beef (saute the beef first, if you put some). We always put beef on birthdays. Weekend is Chicken day. We always order some food during weekend. Because weekend is rest day, I also want to take a rest and free from cooking so on Weekend, we always order food and what we usually order is chicken. I saw in the menu book about the corn pops chicken so I ordered one. I just want to try it. But red combo is one of my favorites. My hubby likes the legs but I prefer to eat the wings. It's more tasty because it has more spices than the legs. Because legs has more flesh and only the outside part of it or only the skin is covered with spices. Red Combo chicken composed of only chicken and wings. It tastes really good. It's hot and spicy but I love it. Also, an order of chicken is just enough for us. It's perfect. I think because it's only legs and wings unlike when we order whole chicken, we always leave the chest part of the chicken. We don't like that part of chicken so it always goes to our dog. When there's no chest, my dog has a leg.